The Internship and Placement Cell serves as a comprehensive career-counselling and resource centre for students, graduates and alumni. It is our mission to help guide and facilitate the career planning process. The institution has prepared an effective plan of action aimed at the efficient functioning of the cell. The Internship and Placement Cell seeks to make use of the available resources to achieve maximum potential. Training activities have been organised in an effort to prepare the prospective students for campus selection programmes. These activities are carefully-crafted, unique preparatory programmes, focused on promoting exposure to the best within the legal profession. These activities have been developed by the Internship and Placement Cell with a view to equip the aspirants with the self-confidence and preparedness expected from professionals. The Internship and Placement Cell coordinates with the corporate sector in order to provide the adequate infrastructure to facilitate the campus selection programmes. 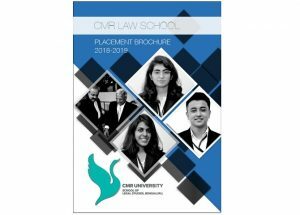 Reputed law firms and corporate houses are approached and, in turn, demonstrate a keen interest to visit our institution and organise campus recruitment programmes. The Cell maintains a cordial relationship with all recruiting agencies in addition to a large body of independent Advocates and Solicitors who look towards CMR University School of Legal Studies as a promising talent pool for recruiting interns and associates each semester.